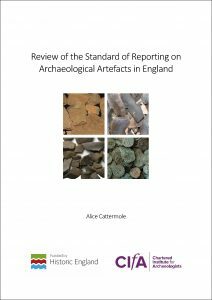 We were recently commissioned by the Chartered Institute for Archaeologists to undertake a review of the standard of reporting on archaeological artefacts in England, funded by Historic England. The project involved the analysis of a sample of 1,000 unpublished specialist artefact reports and 61 published specialist artefact reports from journal articles against a checklist of criteria devised to assess their content and quality. This review highlighted the variations in content and quality in specialist artefact reports and presented a series of recommendations to support the application of standards in artefact work.